Call the FBI! China Is Trying To Steal America's Seeds! : The Salt In two apparently unrelated cases this week, federal prosecutors arrested citizens of China and charged them with stealing seeds that American companies consider valuable intellectual property. Court documents offer an entertaining mixture of Midwestern farming, alleged corporate espionage and a whiff of international intrigue. Call the FBI! China Is Trying To Steal America's Seeds! 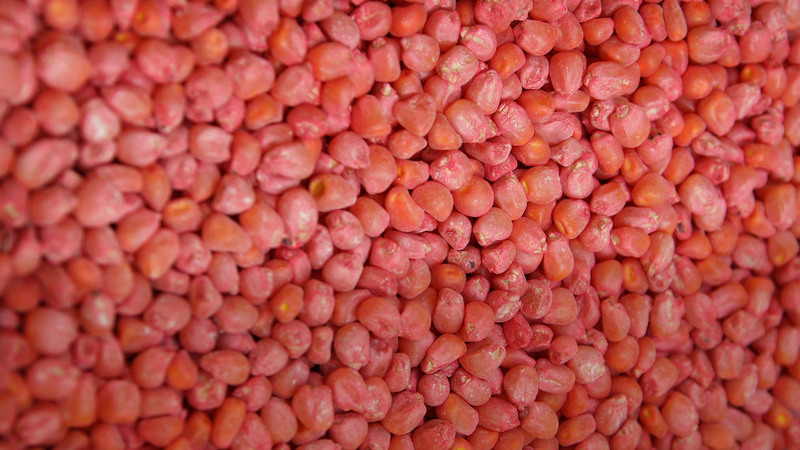 Seed corn sits in the hopper of a planter. If you think grains of rice or kernels of corn are free gifts of nature, think again. Seed companies — and the FBI — take a very different attitude, and walking off with the wrong seeds can land you in very serious trouble indeed. In two apparently unrelated cases this week, federal prosecutors arrested citizens of China and charged them with stealing seeds that American companies consider valuable intellectual property. One case involves corn in Iowa; the other, genetically engineered rice in Kansas. Court documents filed in each case (corn here, rice here) offer an entertaining mixture of Midwestern farming, alleged corporate espionage and a whiff of international intrigue. The corn caper began with a curious confrontation more than two years ago, when a field manager for DuPont Pioneer, a leading seed company, found a Chinese man on his knees in a corn field near Tama, Iowa. This wasn't just any corn field. Pioneer was using this one to grow what's called an "inbred line" of corn. Inbred lines are the parents of the hybrid corn that seed companies sell to farmers, and they're probably the most tightly guarded secrets in the business. The Chinese man, apparently looking red-faced and nervous, made a quick getaway, but not before the Pioneer employee got the license plate number of his rental car. The car had been rented to a man named Mo Hailong. The FBI says Mo, a lawful permanent resident of the U.S. who lives in Florida, works for a Chinese seed company called Kings Nower Seed. That encounter eventually led to a full-scale FBI investigation in which the bureau monitored Mo's mail and followed him (and several colleagues) as he traveled the Midwest, collecting seeds from fields. The FBI even installed a listening device in a rental car that some of Mo's colleagues used. It captured a rather sad conversation in which two Chinese men complained to each other about their assignment, which they considered pointless and risky. "These are actually very serious offenses," said one. The other responded: "They could treat us as spies!" Last year, the FBI seized samples of seeds from several Chinese men involved in the operation. Several samples, according to court documents, were inbred lines of corn. This week, Mo Hailong was arrested and charged with conspiracy to steal trade secrets. In an intriguing side note, the FBI says that it is continuing to investigate "several potential 'insiders' at U.S.-based seed companies" who may have provided Mo and his alleged co-conspirators information on where the companies were growing their most valuable seeds. The second case, involving genetically engineered rice, appears to be a much less sophisticated case of alleged theft. Weiqiang Zhang, a Chinese employee of of a company that court documents call "Company A," is charged with stealing some samples of the company's genetically engineered rice and providing these seeds to scientists in China. Our colleague Bryan Thompson at Kansas Public Radio identified "Company A" as Ventria Bioscience, based in Colorado Springs, Colo.
Ventria's work has sometimes provoked controversy in the United States. The company inserts new genes into rice, allowing the rice plant to produce proteins that can be useful in treating diseases. But the conventional rice industry doesn't want Ventria's rice growing anywhere close to fields of rice intended for food. Ventria does grow some rice near a facility in Junction City, Kan., and this is where Zhang worked. It's unclear whether anyone in China actually asked Zhang to acquire such seeds. It appears, from a letter quoted in one court document, that Zhang was trying to land a job with a research institute in China and hoped that his access to Ventria's technology might open doors back home.